All of Normandy’s cheesemaking know-how is concentrated in a cheese that is as creamy as one could wish and covered by a deliciously golden rind. Isigny Sainte-Mère makes this square cheese in two sizes, small and classic. It also requires skill and patience to make this cheese, paying attention to fine detail, like a goldsmith. The process is completely different to making a Camembert. Pont l’Evèque is a subtle and elegant cheese that exudes an exquisite aroma of hazelnuts. This, on a cheese board alongside a noble PDO Normandy Camembert, is a match made in heaven. Serve it with slices of good country bread, or a few dried figs. Ideally, it should be sampled with a glass of chilled cider or a favourite wine. 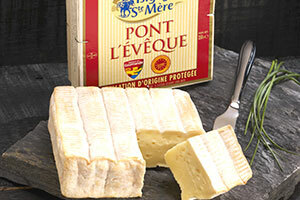 Pont-l’Évêque cheese has benefited from Protected Designation of Origin since 1996. This sign of quality is administered by the European Union. If you choose one of our Pont l’Evèque cheeses carrying its PDO logo, you will encounter the sweet, milky taste that has made this cheese popular since the 12th century, when it was created by CIstercian monks. The golden rind conceals an ivory-coloured cheese. 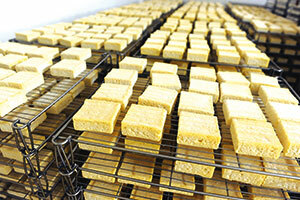 It has been a square cheese since the 18th century, when it was made in wooden moulds. The Pont l’Evèque is an edible history lesson covering the traditions and values inherent in the lower Normandy terroir. The PDO status guarantees the provenance of the milk, the way the cattle are kept and fed, as well as the way the cheese is made. Our PDO Pont l’Evèque is made from the finest Normandy milks. These are distinguished by their exceptional richness, high fat content, high levels of protein, Omega-3 fatty acids and vitamins, as well as by their lactic bacterial flora that is characteristic of the Isigny terroir. The milk is heated and rennet is added to coagulate it. The curd is then cut, the whey is drained off and the curds are turned out of the vat. The whey is removed to limit lactose levels and curb the development of lactic cultures which feed on lactose. This explains why Pont l’Evèque stays a supple cheese. At the end of four days, the cheeses are taken out of the moulds and salted on the fifth day. They are washed in salt water on the seventh day, hence the term washed rind cheese. For the rest of their time in the hâloir, the cheeses are turned by hand as they ripen. Our master cheesemaker watches over the correct development of the crust and the texture of the cheese. A Pont l’Evèque will express its full characteristics as it undergoes a slow and careful ripening that can last between 13 days and six weeks.